Today was my last day at work and the day was very chilled out. The shop wasn't very busy so we had a relaxing day and it was a nice opportunity to reflect on my time here. 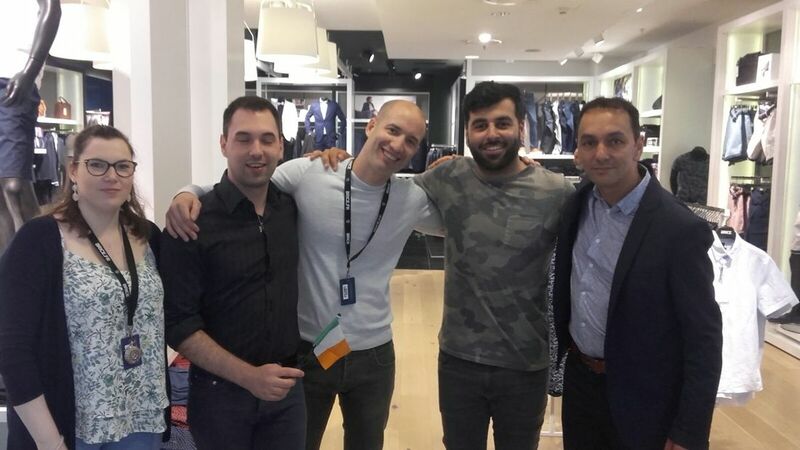 One of the interesting things I noticed about French customers during my time here, is that when they go to the changing room and try on the clothes, they then come out and stand as one of the shop assistants would come over and fix the clothes on them. They would fit it properly by fixing the trousers and shirt or jumper. Reflecting back on the whole experience it was great. I learned a lot of skills in relation to fashion, and got to work in a different environment, making some new friends that i'll stay in touch with. I enjoyed it a lot and would definitely recommend it to anybody. Today I started my day as usual when I arrived to work at 10am. An unusually large delivery has arrived with lots of new stock for the store. My coworkers and I began to unpack the delivery. It was my responsibility to add security tags to all of the items. This took the majority of the morning due to the large array of items. After lunch I helped re arrange the store to accommodate the new stock. Here in France there is no stock rooms so all stock which comes in from deliveries must be placed on the shop floor. I find this very surprising as there is often too many items to fit on a rail or the pile of t shirts is too high. It is hard for customers to find their size due to this and I personally think it is one of the stores downfalls compared to at home in Ireland. Kader came to visit me today also. He spoke with the store manager and we took some pictures also. It was certainly nice to see a friendly face. I also had my first English customer today and I helped pick several items with them. I enjoyed being able to successfully help a customer as I feel I can not completely fulfil a French customers requests due to the language barrier. My French has certainly improved but I’m definitely still not too good with the grammar. There is very little people who speak English here in Grenoble compared to other places we have visited such as Annecy and Geneva. It is nice to meet French people who make an effort to speak English with us and vice versa also. In terms of retail skills, I have definitely learned how to interact with customers and improved the steps to making a sale. The store presentation is very important here in France so we must tidy when it is not busy or we have spare time. This I found rather repetitive at times and was my least enjoyable part of work. Today was a good day at work as there were a lot tasks to be completed, and time flies when your busy. Today we rearranged the majority of the displays in the store and also the shop windows. In the morning I removed all the stock from the windows and retrieving the new stock needed for the display. A major problem I’ve noticed with the store is space. At times the store can look very crowded, when you remove one display it’s very hard to make room for them anywhere else. This was a major problem today and I had to put a lot of the stock back into the store room. After lunch I put together the second window which displayed all new stock of whiskey that we got in the order last week. Although the shop was quite today it helped as we got a lot of work done around the shop without disturbing any customers. For the last hour of work I was serving customers and hanging new signs and price tags around the store. Today we took a spontaneous trip to Annecy, a nearby town, after Kader recommended for us to go there. We did not want to book train tickets in advance as the rail strikes are still ongoing here. This is interesting and so different to home. We luckily managed to catch a train just in time, from the train station. It was such a beautiful city, quite similar in architecture to Venice with the river running through the town. There was an antique market taking place which was nice to browse through. Local artists were also displaying their work along the river. We ate lunch at a quaint restaurant at the rivers edge also. Afterwards we headed to the lake where we rented our own motor boat for an hour and took it out around the lake. The views were incredible and it was such a hot day with the water being so calm. We all had a go at driving the boat- a first for all of us! We walked through the national park afterwards and got some ice cream, before relaxing in the park for a while; talking about our last week of work and how quick the trip has flown by for all of us. We are certainly feeling very grateful for this opportunity and all of the experiences we have gained in the past two weeks. Tomorrow we head to the Bastille to go zip lining which I am really looking forward to. When I arrived at work today the deliveries arrived straight away. Firstly we got all the fresh Irish produce like sausages, rashers and pudding. The majority of the deliveries were orders people had sent into the shop. The other students I work with bagged each order and I then placed each persons name on each order for them to collect them. I did notice that an Irish bar here in Grenoble had two large boxes on order which is great income for the store as the products prices were higher than compared to what you would pay in Ireland for a packet of sausages. This was interesting to note and to see how they handle produce from overseas. After this we got another large delivery in and this delivery was full of different types of stock, from drinks to biscuits. My job was to mark off what everyone was putting away and making sure we got all the right products. I’ve been teaching my manager a bit of English also, so I feel she understands me a bit more now and the communication is getting easier. It has been a good opportunity to develop my language skills and also to help others. In the evening I helped rearrange the display but overall the store was very quite. In the evening we decided to go for dinner and chill out around the town after a long week. Tomorrow we plan to head to a beautiful town called Annecy, which was recommended by many people so we are all looking forward to that. This morning started off with a bang, as we had a big delivery at Brice. We got five boxes of new stock in. My main task was to unpack all the garments and put them on hangers so they could be put on the shop floor. I also got the opportunity to do a small bit of visual merchandising, this consisted of re-arranging some of the clothes on the floor where I got to put int practice some of the skills that I had previously developed. Today I also got introduced to some staff that I hadn't met before. For me it was good as they spoke English and I had someone I could chat with whilst working. During the day I also served some customers, a couple of people spoke English which was great, although I am managing to practice my French language skills. In the evening when the shop got a bit quieter, I started to steam some of the clothes so that they were fresh. Some of the new stock that had arrived in the delivery was very wrinkled so the steaming helped straighten them and afterwards I put them back out on display. Overall it was a good day, I was kept busy and met some new people. I also served some customers with the little French phrases that I have and also learned some new things in regards to merchandising. Today was our first day back to work after the long weekend. I got the tram to work as usual with Yaqub. When I arrived to work I helped unpack the daily delivery and put security tags on all of the products. This is my daily morning routine now at work. Today we had lunch outside of the hockey stadium. One of the other French students at Yaqub’s store also joined us. He gave us some background information on Grenoble; places to visit and things to see or watch out for. We also listened to some French music which was different to our music taste at home which was interesting. After lunch I helped Delphine (my co-worker) with one of the mannequin displays. I helped select and steam the clothing while she assembled the mannequins. It is interesting to see the similarities and contrasts between France and Ireland. I notice in the store, loyalty cards are a lot more popular than at home. We always encourage people to join but it is very rare that they are not already registered. Prices are similar here in terms of clothing. All customers tend to buy something when they visit the store or have a firm idea of what they are looking for when they come in. My retail skills are definitely improving immensely along with my language skills. I am a lot more confident approaching customers this week as I have more of an understanding of the store and it’s products but also, I am learning how to make a sale by evaluating the customers needs. Today was Whit Monday in France which is a holy day here, and because of this we all had the day off work. We were lucky enough to have a long weekend. In the morning we went into town but unfortunately everything was shut down today. We then decided to go check out if the shopping centre was open. The shopping was actually quite busy as people all spent this holiday with family or out shopping. So far I’ve noticed prices are somewhat similar if not a little more expensive over here than back home. I’ve even noticed this in my own shop where I am on placement, mainly because the goods are all important type products. The big thing I’ve noticed is that, not as many people speak English in Grenoble as I would have thought. For example, when we traveled to Geneva on Saturday, most people spoke English to us because it was more of a tourist area. I have definitely improved on my French language skills since I got here. 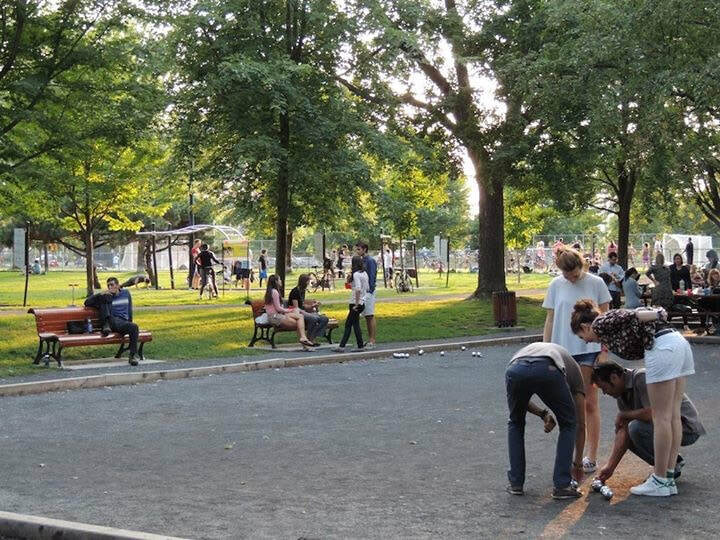 In the evening we decided to explore down streets that we hadn’t been, where we came across a park which was very busy with many people playing music, juggling and playing boules, which is a French game. We tried our hand at playing a game or two and it was something new we experienced today. My store is closed on Monday so I had the day to myself. I decided to get the ‘A’ tram to ‘Grand Place’ which is the massive shopping centre. I strolled around all the high street stores as well as discovering the local French branded stores. Avoiding the temptation to buy anything, it was interesting to take note of the similarities/differences in regards to retail here in France to back in Ireland. I’ve noticed that not many people speak any English in this town compared to when I holidayed in other parts of France with my family. I find it quite difficult in communicating with the locals but eventually with my basic vocabulary and hand signals I eventually found ways around this! I met with Carrie and Yaqub after they finished work at 5pm, as we have been warned to not travel alone on the trams in the evening. On returning to our hotel, I ate and relaxed for a while before Carrie, Jenny and myself strolled into town for the evening. Visiting the 'Shannon Pub’ was recommended to us and not to our surprise it was full of the locals watching football. We stayed here for awhile and chatted to the bar man, he was full of recommendations of things to do and also what restaurants to visit. The locals seem to go for a casual few drinks every evening after work and I found this quiet strange as the majority of Irish people go home for a cup of tea and leave going out until the weekend. Sunday’s here in Grenoble are extremely quiet. Most shops and restaurants are closed, leaving the streets almost empty. Today we went exploring the town again. We came across a beautiful national park, “Paul’s Mistral Park”. This must be where all the locals hang out, as it was packed. The park was full of people playing games, cycling, roller-blading and just relaxing in the sun. It started to pour rain later in the day along with thunder storms, the weather here is so hit and miss. It’s roasting one minute with temperatures above 20 degrees, and the next it is raining so heavily with thunder and lightning. The women in my boutique said it’s been the worst May recorded in 20 years! We decided that we’d go to the cinema for the evening. We watched ‘Dead Pool 2’ as this was the only movie available with English subtitles. Strangely the most poplar food in this cinema was to what I can describe as a cheeseboard with little crackers in a box! I opted for the safer option of large popcorn and fountain coke. I am really looking forward to tomorrow as we all have the day off due to the public holiday here, so we get to explore this wonderful area a bit more.